A Power Digimon endowed with the arm strength to crush anything and the leg strength to crush things underfoot no matter how hard they are. 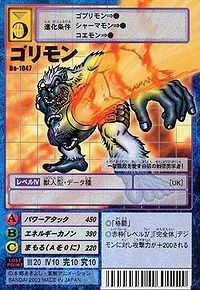 However, it surprises the opponent with light movements that aren't expected from its physique, and seizes the opportunity to add to the attack with the Energy Cannon on its right hand. It found its aesthetic in "Hit and Away". Its Special Move "Power Attack" is super-powerful. Its Special Move is Power Attack. 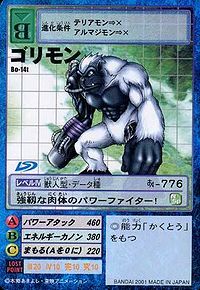 — Digimon Adventure 02: "Shurimon's Hurricane"
Beast Man type, Adult level. Its Special Move is Power Attack. — Digimon Tamers: "A Tamer's Task! 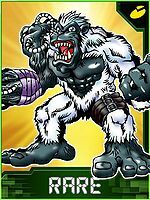 Defeat Gorimon"
Anime/Manga Two Great Ultimate Evolutions! Get Rid of the Darkness! Energy Cannon  エネルギーカノン Enerugī Kanon Energy Cannon Fires its Energy Cannon. Gorimon appeared for a mere second in Two Great Ultimate Evolutions! Get Rid of the Darkness!. Just after the destruction of Venom Vamdemon when it was seen on a news broadcast that was showing some Digimon attacking other parts of the Real World. While at Digitamamon's restaurant, Michael mentions that he saw a Gorimon in the past which led to him becoming a Chosen Child. Shortly thereafter a Gorimon under the control of an Evil Spiral attacked the Chosen Children. 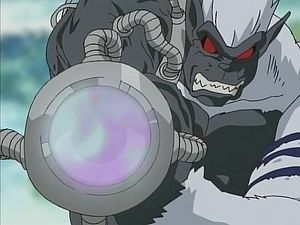 A Gorimon is pictured as one of the Digimon killed by Kurata Akihiro's forces. 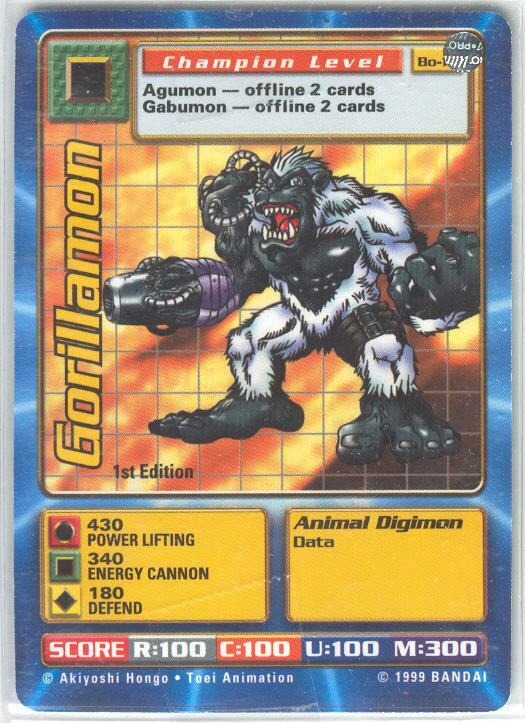 Gorimon is a recruitable land-based Digimon. It appears as an enemy in the Demon's Shrine (Left) and Millenniumon's lair. Gorimon is a recruitable land-based Digimon. It appears as an enemy in the Demon's Shrine (Left). Gorimon is an obtainable Digimon. It evolves from Goburimon and evolves to Mammon. 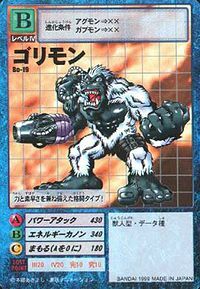 Its skill is Power Attack, which raises its attack power. Gorimon is available as a Digimon Medal. Gorimon is an obtainable Digimon. 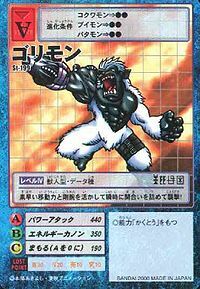 Evolves from Gabumon and can evolve to Death Meramon. 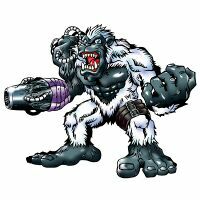 It uses its speedy movements and powerful arms to quickly take advantage of any openings and attack! A fighting-type that possesses both power and speed! 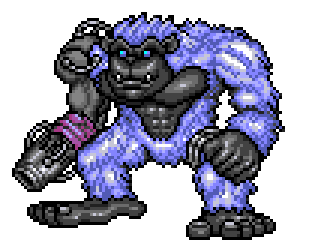 This white primate strategises with aesthetic sense and loves hit-and-run tactics! A power fighter with a strong body! ↑ Digimon Adventure 02: "Shurimon's Hurricane"
↑ The attack is unidentified in the anime, but confirmed to be Power Attack in the Official Big Picture Book III. This page was last modified on 12 April 2019, at 19:07.